As one with no particular love or particular distaste for Bond films, I am more than happy to welcome variances in the franchise. Spectre‘s combination of terseness, economy and patience feels like a union between the characters of Bond and his new antaongist, Oberhauser/Blofeld, and the dynamic between the two characters proved to be the most interesting part of Spectre – mainly because they feel like characters existing in two separate films or film universes (it’s worth noting that Gary Oldman had been initially approached to play Blofeld and turned down the role due to scheduling conflicts, and while I’m perfectly happy with Waltz one can’t deny that would’ve been quite a show). Until the last 45 minutes of Spectre when he faces off with Bond, Oberhauser/Blofeld is understood to us only through grave insinuation, often not even via any exposition but through pace, scoring and quiet – which I found to be surprisingly effective – and when a film-and-a-half’s worth of tight, abdominal anxiety reaches it pitch, the effect may feel anticlimactic to some viewers. This iteration of James Bond is a Draper-ish “when a man was a man” brute; terse, stone-cold, physically robust, strong and silent. Christoph Waltz is 5’7″ (granted, Craig is only 5’10”), his eyes sparkle with intelligence and curiosity and his performance is outright delicate, his calm imperturbable in the way that a billionaire or monarch would feel beyond any quotidian struggles or emotions. Pitted against this Bond, what is the result? He certainly did not feel to me like a cataclysmic meteorite – that’s what Bond feels like – but more like the Smart Blood in Bond’s veins, coursing though the circulatory system of civilization, wielding a power whose insidious profundity eclipses anything as freshmen as muscle. Why shouldn’t he be so calm? And what can Bond hope to do about it? Bond’s banter falls flat, the usual subtext being, “You may be in charge right now – but get you and I alone in a room together and you won’t last fifteen seconds.” In the face of Blofeld the application of this ferocious will feels as pointless as hurling threats in a foreign language, or writing a manifesto in a Comments section. When his invaluable lair is destroyed, when he is disfigured, even when he suffers spinal paralysis in the climax, Blofeld’s calm is not shaken. He welcomes his executioner with the zen of a man who has achieved everything he’s wanted to achieve in the span of a life – “This is the end, huh? Had to happen. If you must.” And with no possible catharsis, no emotional satisfaction to relish, no moral righteousness to wield, Bond opts to walk away – not because it was “right” or because he wouldn’t want to give Blofeld the satisfaction of proving to Bond that he is merely a killer. I can understand why this film would fail to satisfy any number of Bondophiles. But Waltz’s Blofeld may be the most fascinating Bond villain. Blofeld’s motivations are equally as enigmatic as his presentation. Take Raoul Silva (A Rival Soul) who, despite the implausible level of control he exerted over his surroundings, was only ever “acting out” emotionally, that petulant Momma’s Boy who needed to see the shame and fear in the faces of his victims (villain theatricality is a screenwriter’s guilty lifelong mistress). 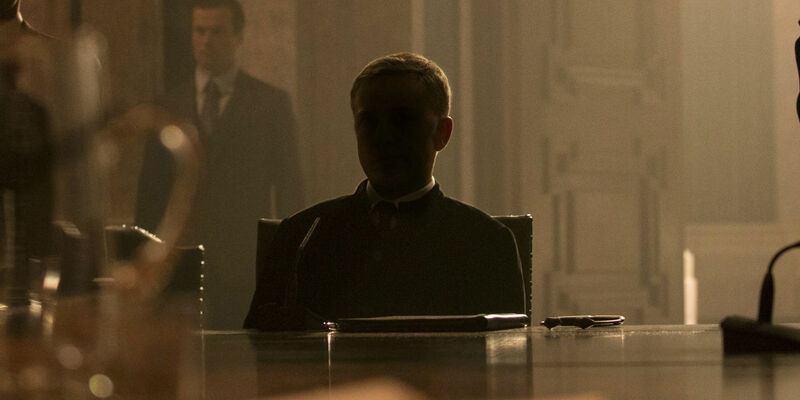 Allegedly there is a cut Spectre scene in which Blofeld eats a dinner with Bond and Swann, during which Bond says something which “gets to him.” Cut for time, or because it would’ve given Blofeld a vulnerability? Blofeld’s imperturbability would suggest he has no axe to grind, no necessary catharsis on deck, which begs the question of why he desired Bond’s company. We’re led to believe that, on some submerged psychological level, Blofeld resents Bond for usurping the attention of his late father (these mistresses keep coming out of the woodwork), but this does not feel entirely truthful because, commensurate with the rest of his personality, Blofeld exists beyond conventional conflicts. I get the impression he is one of those men whose ambition took him from the depths of nothing to the greatest ascendable height, and that his past feels like another unfathomably distant lifetime. So when Bond crops up in his periphery, meddling in his sinister Spectry business, Blofeld’s reaction would not be Pavlovian salivating, fang-bearing hunger, but a detached wonder at the impressive incidental occurrence. “Oh my… James Bond! The odds must be a million to one. I should really say hello to him.” I don’t imagine he has anything to gain from the encounter but amusement – because, of course, at that level of power and influence, how many unexpected pleasures do you really have to look forward to? “The dead are alive,” the easily forgotten title card the likes of which is not present in any other Bond film. The suspiciously simple Nine Eyes spy merger taking place under C in London. Bellucci’s role being relegated to a cameo, her fate uncared for, another notch in the bedposts. The failure to establish any sense of passing time within the narrative – it seems to have all taken place within 48 hours. Mlle. Swann’s stubborn, final desire to be separate from her father followed one scene later by her insistence that she will tag along with Bond because she wants to understand what her father was involved in. The rationale behind Blofeld’s welcoming of Bond into his lair, followed by a tour. The failure of Blofeld’s surgical tortures on Bond, meant to affect his sight, hearing, balance and memory and which seem to have no effect at all, especially baffling considering Blofeld’s success record in so much else. The gargantuan, seeming self-destruction of Blofeld’s crater lair – I don’t know what we’re supposed to make of this. A few of these inconsistencies could have an explanation within the bounds of reason, if one takes seriously Darren Franich’s “Deathdream” theory which posits that Blofeld’s surgical tortures were successful and the film’s final act represents Bond’s fantasy of success as he lays dying on the slab: it would explain why these tortures seem to have no effect on Bond; why the title card precedes the film (as Blofeld muses, Bond is dead and alive all at once, trapped behind his eyes) and why death is more prominently evoked than usual; why after the torture Bond’s balance and lucidity are not only fine but almost superhuman as he, with one hand, dispatches baddies from all sides and extreme distances with an automatic weapon; why everything that happens in the final act revolves personally around Bond and his continuing miraculous wins; why Bond walks away unmarred, in love and in London, and with no indication of any loose ends to be tied in the global Spectre conspiracy. Sadly, I do not believe any of this was intended. But I loved the tentacles!